The species name "Cynops cyanurus" is used in this article to refer to a complex of species/subspecies that includes the taxa cyanurus, chenggongensis and yunnanensis, which are either considered full species, subspecies, or invalid names, depending on the reference. These three species/subspecies are closely related, and it is often impossible to know the true identity of a captive animal from this complex unless you know the locality where the animal (or its ancestors) was collected. The details and controversies surrounding the taxonomy of this group are beyond the scope of this article. The lineages of C. cyanurus currently in captivity have come from a variety of sources. For many years, the only C. cyanurus kept in captivity were derived from a group of animals originating from the Chemnitz Zoo in Germany. Descendents of this lineage have been bred by several people, but the offspring are generally difficult to raise, even in the hands of experienced breeders. While the original adults were hardy and long-lived, their offspring have a reputation for being very delicate and difficult to breed, with high rates of infertile eggs and high mortality of offspring. There are still people keeping animals of this lineage. These animals have a consistently dark brown body color. Since approximately 2004, there have been many C. cyanurus imported from China into the global pet trade. The geographic origin of these animals is unknown. Many have been sold under the name Cynops chenggongensis, although it is unknown whether they truly represent this species/subspecies. The animals from these imports generally have a lighter body color, ranging from medium brown to yellow, with some individuals being gold in coloration. Unlike the Chemnitz strain, animals descended from these imported animals appear to be healthy and fertile for multiple generations. The majority of the animals currently in hobbyist hands are derived from these imports. In the captive care sections of this article, I describe care for C. cyanurus or chenggongensis imported since 2004, as these are the most common animals in captivity. The captive care recommendations given may not be true for other lineages or for other species/subspecies. Most of the information is based on personal experience. In particular, the temperature recommendations may be untrue for other lineages and should be followed with caution. Cynops cyanurus have an adult size that is slightly larger than C. orientalis and smaller than C. pyrrhogaster, with mature females approximately 8-10 cm (3-4 in) and males slightly smaller than females. Body color varies greatly, ranging from dark brown to golden yellow. There is often an indistinct orange line along the vertebral ridge. Belly color varies from yellow to orange, often mottled with black. 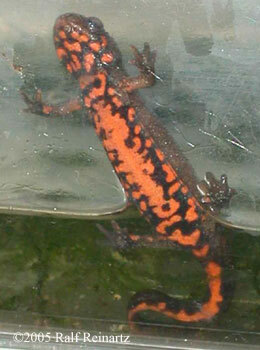 Wild-caught specimens generally have red-orange coloration, and those raised in captivity have yellow or light orange color. An yellow or orange spot is always present just behind the eye, and this is the feature that most clearly distinguishes C. cyanurus from C. orientalis. Males have distinct blue hues on their tales during the breeding season. The blue color may be absent in younger males, but becomes more prominent with age. Little information is available about the natural habitat of C. cyanurus. Most publications describing the species are in Chinese. C. cyanurus is known from Guizhou and Yunnan in southwest China, from 1,790-2,400 m (5800-7900 ft) above sea level. The species is particularly common on the Yunnan Plateau, which has a very mild climate. Yunnan Province has an average low temperature around 2°C (36°F) in winter, and an average high temperature around 24°C (75°F) from April through September. The region has a monsoon climate with heavy rainfall in summer. 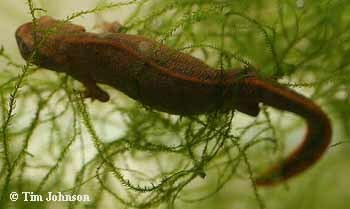 Unfortunately, no information is readily available about the temperature of the specific habitats in which the newts live. The type locality for C. chenggongensis is Shuitan in Chenggong County, Yunnan Province at 1940 m (6360 ft) above sea level. 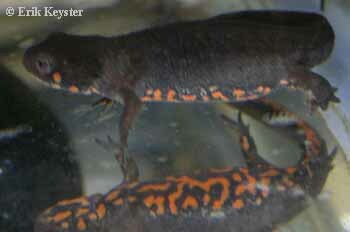 C. cyanurus are highly aquatic newts. Adults do well in an aquarium with a water depth of 15-30 cm (6-12 inches). Like most newts, they should always have an island available in case they need to emerge from the water. Do not plan a large area of land, as this space will be wasted for this species. 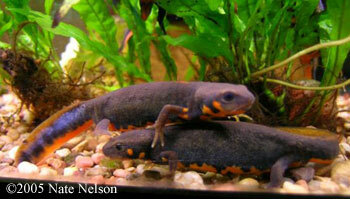 C. cyanurus are believed to be pond-type newts, meaning that they do not normally live in water that has a strong current. Thus filters that create a strong water flow may be detrimental. The amount of tank space required is very similar to that needed for C. orientalis. 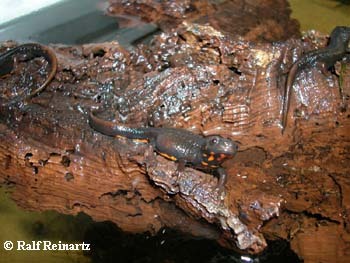 As a rule of thumb, approximately 3 adult newts per 40 liters (10 gallons) of tank size works well. This assumes that the entire tank space is aquatic. The temperature requirements of this species make them ideally suited to human homes. Adult C. cyanurus do well - and breed readily - when kept at temperatures of 16-18°C (60-65°F) in winter and 21-24°C (70-76°F) in summer. Healthy adults can tolerate greater extremes - as low as 10°C (50°F) in winter and as high as 27°C (80°F) in summer, but extended periods at these extremes are not recommended. I have observed significant cold-sensitivity in the larvae and juveniles (see below), so be cautious in choosing an appropriate temperature. When C. cyanurus are shipped with cold packs, they may arrive sluggish and must be given time to recover before being placed in water. C. cyanurus "Chemnitz" strain, mid-metamorphosis. Cynops cyanurus are very good eaters. They will usually eat any appropriately-sized caudate foods, including chopped earthworms (Lumbricus spp. ), blackworms (Lumbriculus spp. ), bloodworms (Chyronimus spp. 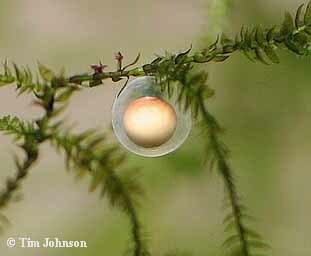 ), Daphnia, and whiteworms (Enchytraeus spp.). Most adults can be adapted to eating suitable pelleted foods with gusto. Suitable pellet foods are soft salmon-chow pellets, shrimp pellets, or other foods formulated for carnivores. C. cyanurus pair in courtship. 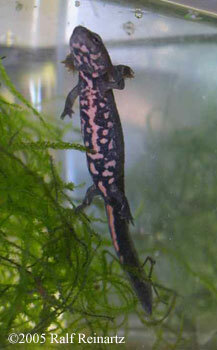 Captive breeding of Cynops cyanurus is easy. 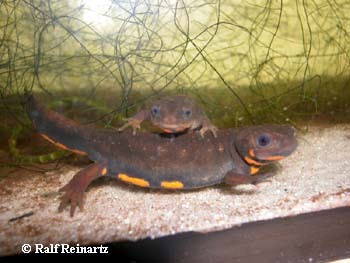 Like most newts, they respond appropriately when provided a cycle of winter/summer temperatures. Being good eaters, it requires little effort to keep them in plump condition for breeding. 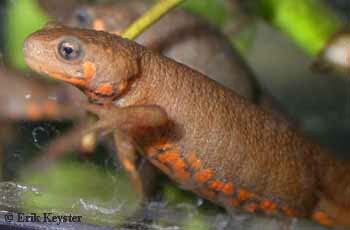 Courtship is similar to that observed in other Cynops, with the male actively fanning his tail to attract the female. The male deposits a spermatophore on the tank bottom, and then lures the female to walk across and pick up the sperm packet with her cloaca. It is common to find fertile eggs in a tank where no courtship has been observed and where the males do not even appear to be in breeding dress. It is likely that the males are able to mate even when they don't appear to be in season. A significant fraction of the eggs may be infertile. Daode and Youhui reported the hatching rate of wild C. cyanurus eggs at only 36%. 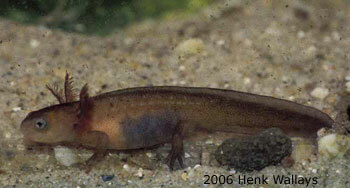 However, the newts seem to compensate for any infertility by producing large numbers of eggs. A well-fed female can produce over 100 eggs in a season. Their breeding season may extend from early spring all the way through the summer months, and even into the fall. C. cyanurus female laying eggs. Eggs hatch approximately 3-4 weeks after laying. The eggs and larvae are cold-sensitive: at temperatures below 65°F (18°C), eggs will take much longer to hatch, and larvae will fail to grow. 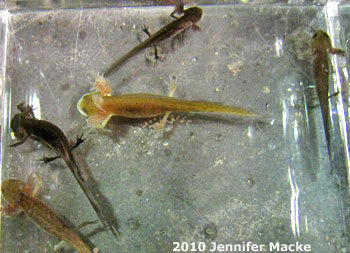 Thus, a good temperature range for rearing larvae is 68-72°F (20-22°C), which is generally warmer than the range recommended for other newt species. Depending on the room temperature, a heater (on its lowest setting) may be necessary. Other than their cold sensitivity, C. cyanurus larvae can be raised using the same methods of raising larvae used for other species. C. cyanurus are typically larger at metamorphosis, as compared with other Cynops. In some cases, larvae complete metamorphosis at >5 cm (2 in) in total length. The reasons for their large size appear to be two-fold. First, C. cyanurus take longer to reach metamorphosis than other Cynops, with the process from hatching to metamorphosis spanning 5-6 months. Second, larval C. cyanurus can eat large amounts of food in a single day and can gorge themselves into a state of plumpness rarely seen in other Cynops larvae. C. cyanurus larvae, showing typical variation in coloration. Another feature of C. cyanurus larvae is striking color variability. The larvae normally range from near-black to near-white. After metamorphosis, the juveniles remain semi-aquatic. After fully completing metamorphosis, they will emerge from the water to some extent, but they will quickly learn to return to the water if food is offered there. 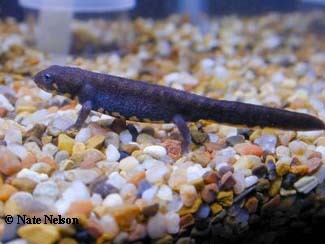 Juveniles can be raised in deeper water than what is usually recommended for other Cynops juveniles, but to be safe from drowning, I recommend an initial water depth of 5-10 cm (2-4 inches) during the early juvenile period. This depth can be increased as the animals grow. Juveniles in their first year may still be somewhat cold sensitive, becoming sluggish at temperatures below 18°C (65°F). Animals reach sexual maturity at 1-2 years of age. It is not unusual for young adults to begin breeding less than a year after their own metamorphosis. Chan, L.M., Zamudio, K.R. and D.B. Wake. 2001. Relationships of the Salamandrid Genera Paramesotriton, Pachytriton, Cynops Based on Mitochondrial DNA Sequences. Copeia, 2001(4), pp. 997E009. China Travel Guide: Kunming climate. Accessed April 2010. Daode, Y. and Youhui, S. 1993. 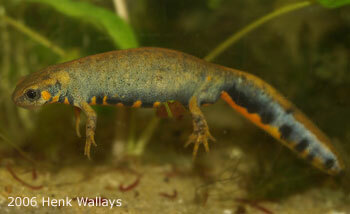 Studies on the Breeding Ecology of Cynops orientalis. Zoological Research 14 (3): 215-220. 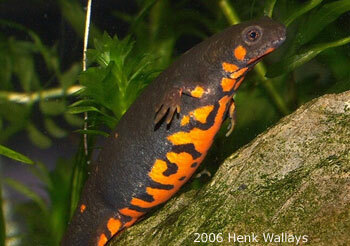 IUCN Red List: Global Amphibian Assessment. Accessed April 2010. Raffaelli, J. 2007. Les Urodeles du Monde. Sparreboom, M. Salamanders of the Old World. © 2010 Jennifer Macke. Posted June 2010.